Despite being infantry Marines, the weapons of choice for Ground Sensor Platoons aren’t bullets. The Tactical Remote Sensor System, or TRSS, is a suite of sensors, cameras, re-transmission devices and monitoring equipment that are used to track enemy movement. The sensors are sensitive enough to detect how many people may be walking nearby, what direction they’re traveling, and can even differentiate between different types of vehicles. Some of the sensors are equipped with day and night imaging capability, allowing Marines to identify the exact nature of their target. And like most equipment fielded by the Marine Corps, the system can take a beating: the Corps claims the sensors and relay equipment can operate autonomously for up to 30 days. All of this makes the Ground Sensor Platoon an important partner to the U.S. Border Patrol. And despite some states withdrawing their National Guard units from the region during President Donald Trump’s immigration crackdown earlier this summer, the Marines show no sign of slowing down: according to photographs released by the Department of Defense, GSP Marines have been in the field with U.S. Border Patrol as recently as March of this year. While the Marines participate in border patrolling in a purely observational capacity, their presence has in the past directly boosted the Border Patrol’s ability to bust drug traffickers and apprehend people suspected of crossing the border illegally. Due to the realism of these missions in terrains similar to Iraq and Afghanistan, one former Marine called it “the best possible training” for the dangerous missions these platoons conduct into enemy territory. According to Customs and Border Patrol data, in 2017 Border Patrol officers apprehended 303,916 people attempting to cross illegally in the Southwest sector, which stretches from California to Texas. Former President George W. Bush’s administration oversaw the construction of almost 700 miles of barriers on the U.S.-Mexico border, and Trump continues to pledge to build a wall across the thousand or so miles without a physical barrier. The Department of Homeland Security has continued to extend and expand the U.S. Border Patrol’s ability to monitor the border with drones, CCTV, and other surveillance methods, but there are still gaps. In 2015, for instance, agents stopped 444,825 migrants while an estimated 200,000 migrants got by them and successfully entered the U.S. illegally. Joint Task Force-North, Customs and Border Patrol, and the Marine Corps declined to repeated requests for interviews and comment on these operations. JTF-N and the Marine Corps cited their policy of not commenting on ongoing missions, while Customs and Border Patrol did not respond to phone calls or emails. Working with U.S. Border Patrol gives these sensor patrol Marines a unique opportunity to prepare for combat abroad. Marines scan miles and miles of hard-scrabbled hills and valleys under an unrelenting heat that punishes men and equipment alike. And just like in Afghanistan, Iraq, Syria, and Africa, the lives of those being tracked depend on their ability to evade American forces. In 2004, Michael Vogel was a young infantry Marine fresh from boot camp, sitting in a squad bay in School of Infantry - East in Camp Geiger, North Carolina. Instructors asked if anyone would be interested in volunteering for a special unit, one that would work behind enemy lines to give advance warning of incoming attacks or IEDs. Unlike infantry platoons of 40 or more Marines, this special unit worked in four-man teams with highly specialized surveillance equipment. Vogel volunteered, intrigued by the idea of going out in front of conventional infantry units. After three months of additional intensive training in topography, equipment specs, and surveillance techniques, he reported to the 4th Ground Sensor Platoon based in Mobile, Alabama. The Ground Sensor Platoons evolved from a Vietnam War-era remote sensor program whose success during the battle of Khe Sahn showcased how important early notice of enemy movement could be. During the wars in Iraq and Afghanistan, Ground Sensor Platoons became invaluable for American troops struggling to maintain control over large areas. For the overworked and undermanned U.S. Border Patrol, the opportunity to utilize military-grade surveillance equipment operated by Marines frees more Border Patrol agents to catch smugglers and undocumented migrants moving north. GSP Marines and U.S. Border Patrol have conducted joint operations along the entire length of the border, and frequently work in one of the most controversial border sectors where a majority of illegal border crossings occur: the Rio Grande Valley. In 2008, Vogel and the rest of 4th GSP arrived at a Customs and Border Patrol base of operations in Texas. Even as a young Marine, Vogel could tell the Border Patrol was struggling to keep up with the influx of humans and drugs crossing into America. "It felt like they were undermanned, they needed routes covered that they just couldn't cover with their personnel." The Border Patrol agents spoke openly about their predicament, admitting "they just couldn't keep up with what was going on out there," as he recalled. During his first time on the border with CBP, Vogel estimated that the Marines passed on roughly 50 to 100 sensor reports a week to their CBP partners, a number that "only increased" during later joint operations in the Rio Grande Valley. Vogel’s platoon worked with the CBP three times before he deployed to Iraq in 2008 and Afghanistan in 2010. On each joint operation, the Border Patrol put Vogel and the GSP Marines to work as soon as they touched down in Texas. The TOC, which stands for Tactical Operations Center, is where GSP Marines keep a constant watch on information feeding into monitors from their sensors, whether in Texas or on the battlefield. Vogel remembered Border Patrol agents wanted the Marines to focus on drug interdiction. Unlike people risking their life to come to America, who often come across the border with little more than the shirt on their back and a bottle of water, Marines were on the lookout for individuals or groups of people carrying large packs that might smuggle drugs. Once located, the Border Patrol could dispatch agents to go out and investigate. Troops, instead of an actual wall, will guard the southern border for now. Perfecting the ability to remain “out of sight, out of mind” is crucial for Ground Sensor Platoons operating in combat, as their primary role in war zones is to stealthily advance ahead of the main troops, tracking insurgents with their sensors in a deadly game of cat and mouse. It was a game the Vogel played with insurgents in Iraq and the Taliban in Afghanistan, with more than one close call. The partnership between US Marines and US Border Patrol is part of a long standing effort by Joint Task Force-North, a DoD task force based in Fort Bliss, Texas. The task force pairs law enforcement groups with military units that can best assist them on counter-terror and homeland security missions. The military has a long history of being deployed to the border, but after a 1997 incident in Texas when a Marine killed a U.S. citizen herding goats, the military drastically reduced its presence in the area. The task force in charge of coordinating military and law enforcement efforts at the time, Joint Task Force-6, was rebranded as Joint Task Force-North with a new pledge to ensure similar incidents never occurred again, while continuing the military’s coordination with law enforcement agencies. After some states have pulled their National Guard units from the border in protest of a White House policy to separate detained parents from their children, GSP Marines have continued operations. 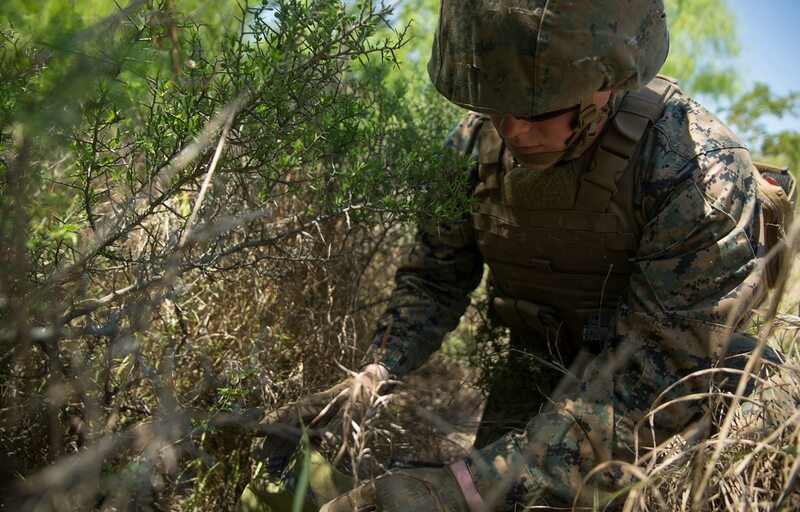 According to photos released by the Department of Defense, it appears that Ground Sensor Platoon Marines have been working with U.S. Border Patrol in Texas as recently as late March.